Tottenham are set to be involved in a summer battle to sign Crystal Palace attacker Wilfried Zaha, according to the Sun. The newspaper claims that Spurs, Manchester City, Arsenal and Chelsea are all expected to battle for his signature at the end of the season. It is understood that the £50million-rated attacker is likely to attract interest from a host of top English clubs, as they feel he can make the step up in the Premier League. The report further details that Man City manager Pep Guardiola feels the Ivory Coast international can help his side in Europe and has been impressed by his performances. 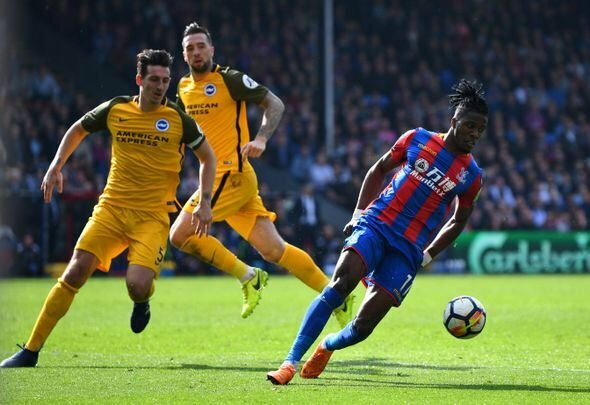 Zaha has helped Palace moved six points clear of the relegation places and is regarded as the standout player at Selhurst Park. Zaha is certainly a technically gifted attacker that can play as either a centre-forward or a right-winger. He makes Palace tick when he plays and has seven goals in just 25 Premier League appearances. The speed demon would be a strong fit in Mauricio Pochettino’s squad, but his colossal £50million price tag may be slightly overpriced and people could point towards his injury problems. There is set to be a lot of interest in Zaha over the summer and Spurs would have to pay over the odds to get him. This Is Futbol rating: 4/10?? Spurs have been frequently linked with Zaha in the past and it is easy to see him imagine playing for the North London club. However, Man City’s interest is a real concern and they could easily muscle in with their financial power to snap him up in the summer.